Located on a remote mountainside in the Peloponnese, Epicurius, the Temple of Apollo at Bassae is an exceptionally large, well-preserved Classical temple. It is unique in many ways, not least in the combination of Doric, Ionic and Corinthian elements. A "temporary" protective tent was erected over the temple in 1987 that still remains in place today. 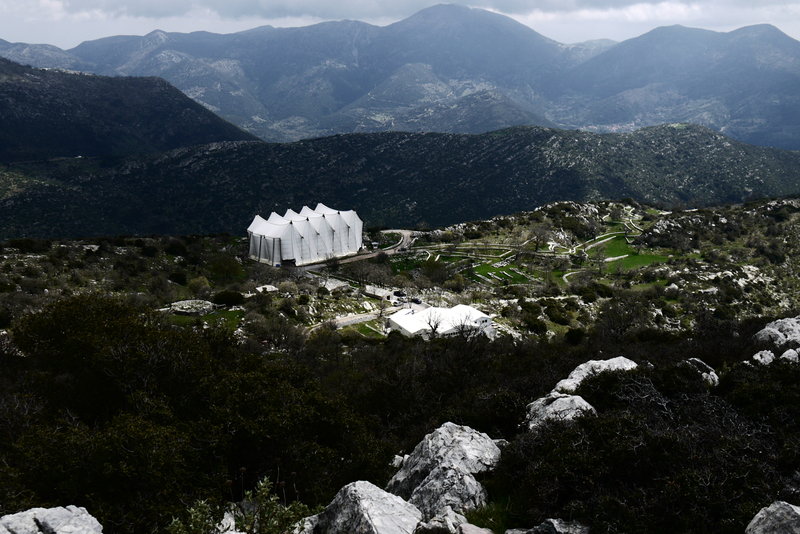 It keeps out the extremes of the mountain weather, but obscures much of the architectural beauty of this celebrated Classical temple. The temple seen today was not the first to stand on this site which is at an elevation of 1,131 metres above sea level on the slopes of Kotylion Mountain. The earliest temple of Apollo erected in the late seventh century BC, possibly at the same location, was rebuilt at least twice in approximately 600 and 500 BC. Excavations have shown that the foundations of the Temple reused blocks from at least one older temple. Artifacts from the 7th, 6th, and 5th centuries BC have been discovered, including some terracotta decoration. Votive offerings from many periods have also been uncovered, dating all the way back to Geometric times. The style of the temple seems to indicate that it was built about 425 BC around the time of the Parthenon in Athens.. 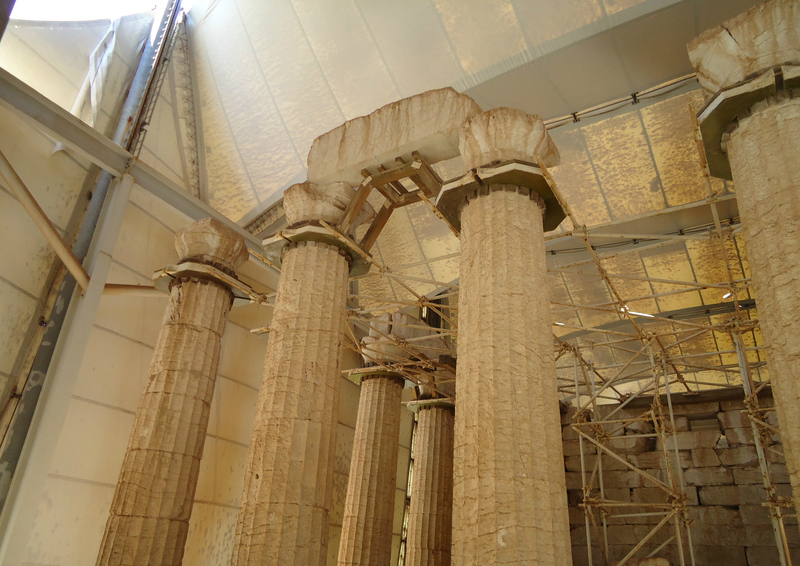 The design has been attributed to Iktinos, architect of the Parthenon. 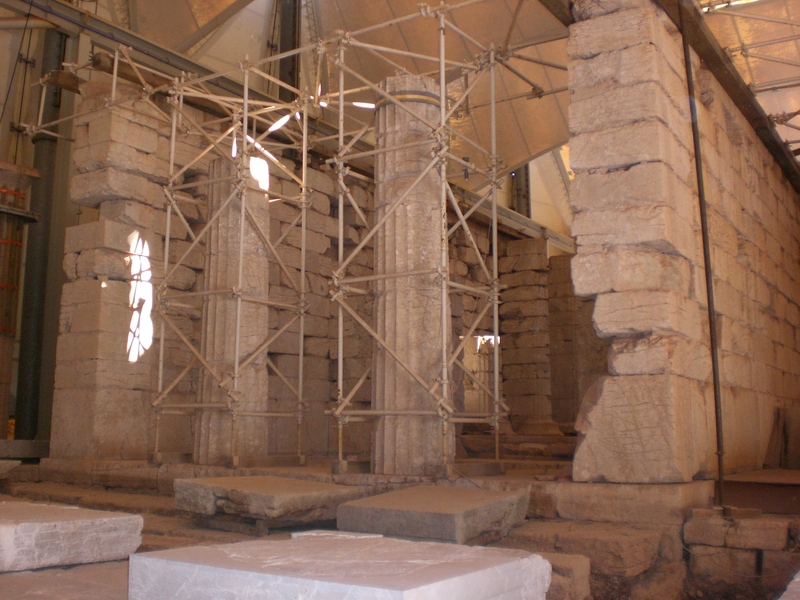 The temple's isolated location and unusual dedication (epikourios means "helper" or "protector") have kept antiquarians puzzled for over 200 years. 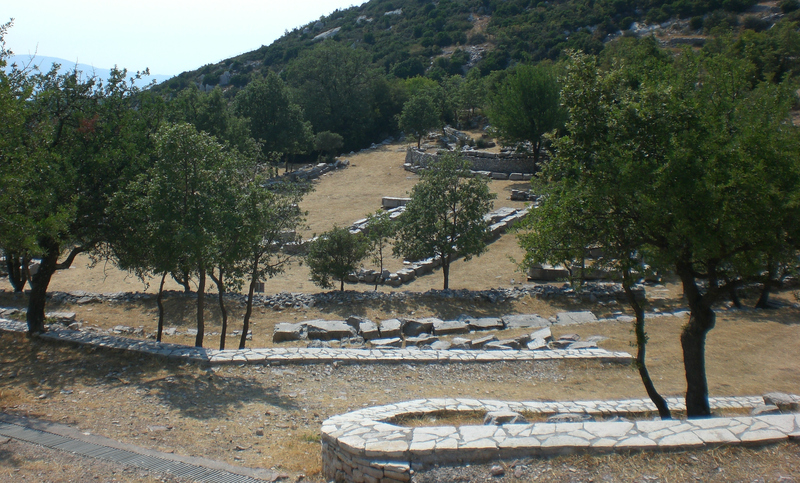 One explanation is that the villagers of nearby Figalia prayed to Apollo for protection from a plague and built the temple in gratitude for his help. Another theory is that Apollo was considered the protector of the Arcadians, especially mercenaries, who funded the temple. Epicurius the Temple of Apollo at Bassae is the full name by which the temple is known. The building has been reasonably well preserved, in part due to its distance from towns and villages; it was simply too far to remove the stones to make use of them for local constructions. The ancient ruin was not rediscovered until 1765, when the French architect Joachim Bocher stumbled on it by accident. 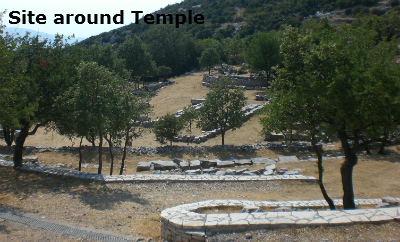 This classic temple was sited on bedrock, on a specially built terrace and is orientated north-south instead of the usual east-west of most Greek temples, possibly because of local tradition. The building is of local grey limestone, with parts of the roof, the capitals of the cella and the sculptural decoration being of marble. The outer columns consist of 15 Doric columns on the long sides and 6 Doric columns on the ends. The architrave has survived mostly intact, but the pediment and roof have long since disappeared. Among the many mysteries of this unique temple was whether it originally contained a cult statue though no base for an image has been found. However, the Greek writer Pausanius recorded that there was a bronze Apollo statue at Bassae, which was moved to the agora of Megalopolis in 369 BC. 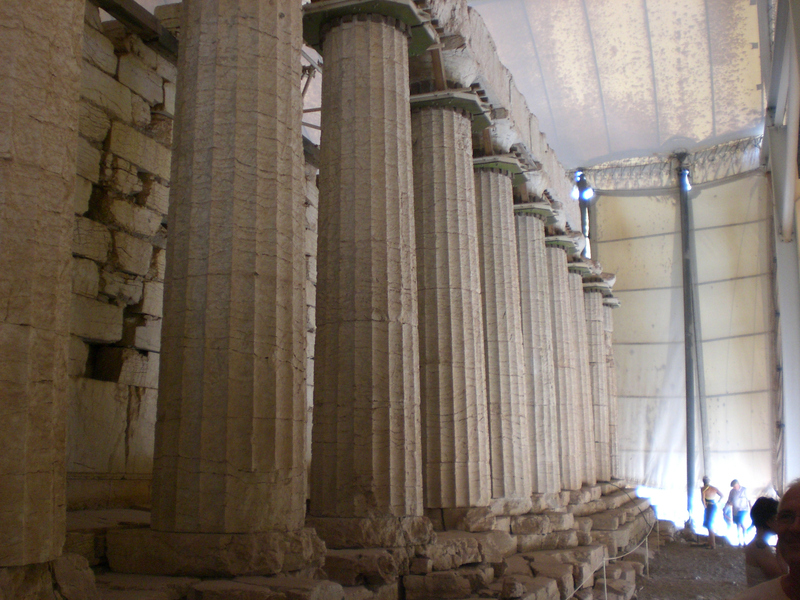 In 1811-12, British and German archaeologists did some work at the site, then the Greek Archaeological Socienty restored the temple from 1902 to 1906. Another renovation was carried out in the 1960s, during which some fragments of the frieze were excavated. In 1975 the newly founded Committee for the Conservation of the Temple of Apollo Epicurius began a programme for the monument's conservation and restoration. The Committee was reformed in 1982 and the Ministry of Culture has been overseeing the difficult task of restoring the monument ever since. 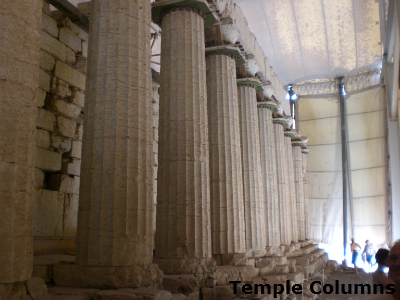 The temple's main decorative feature was the marble Ionic frieze supported by the Ionic half-columns of the cella. 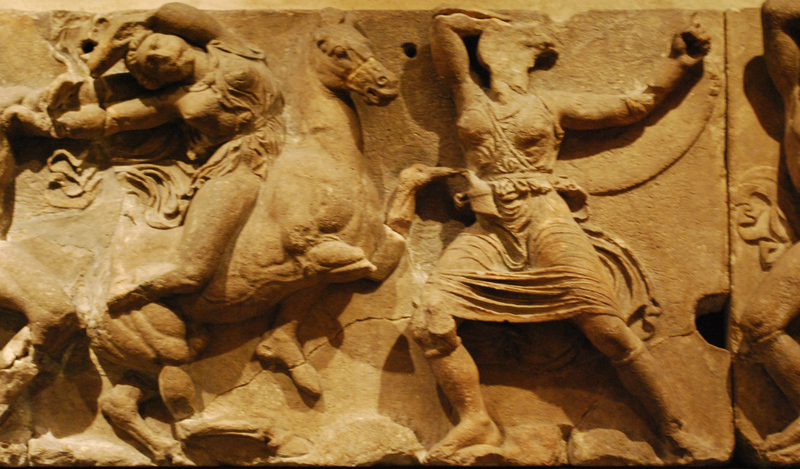 This frieze was thirty-one metres long and consisted of twenty-three marble slabs, of which twelve depicted battles between Greeks and Amazons and the remaining eleven showed battles between Lapiths and Centaurs. 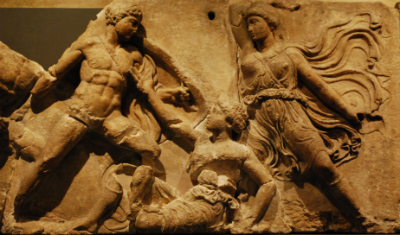 The frieze cannot be associated with any sculptor, workshop or school. Instead Cooper identified the artists of the frieze on art historians evidence as being the work of a group of three anonymous masters. The site was explored in 1812 with the permission of Veli Pasha, the Turkish commander of the Peloponnese, by a group of British archaeologists who removed twenty-three slabs from the Ionic cella frieze and transported them to Zante along with other sculptures. Frieze photographs courtesy of Sarah Murray whose wonderful display can be seen on Flickr. Pasha's claim on the finds were silenced in exchange for a small bribe, and the frieze was bought at auction by the British Museum in 1815 for 19,000 pounds. This frieze's metopes were removed personally by Charles Robert Cockerell. (They are still to be seen in the British Museum's Gallery 16, near the Parthenon Marbles.) Should Greece be asking for these back as well as the Parthenon Marbles? There are also some slabs on display in the Louvre Museum. 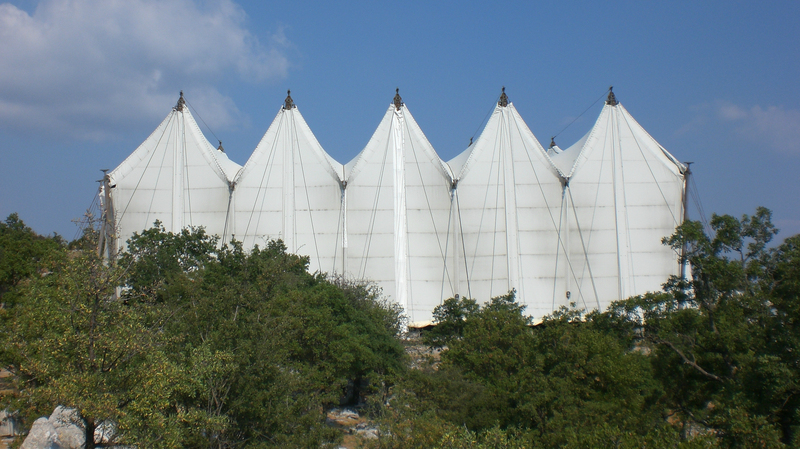 Is the drive into the wilds to see a temple under a tent worthwhile? Without doubt the answer is yes. 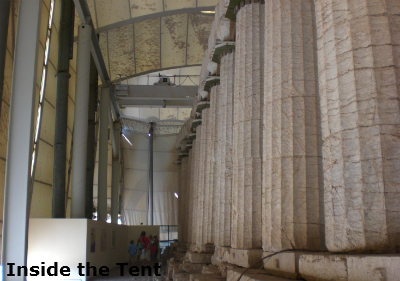 The tent itself is an amazing feat of engineering and the equipment they are using for the renovations make you wonder how on earth they built such a wonderful building 2,500 years ago! There is a video showing the replacing of one of the renovated columns and the precision is really something to see.